"Can we just for once die without all this bickering?" Ten years ago or so, when computer graphics really began to take hold in film, there were fearful conjectures about wholly-digital films with long-deceased actors going through their paces. While this was generally considered to be a fairly obnoxious nightmare if not a complete pipedream, the possibilities of the technology have increased exponentially since then. Surprisingly enough, one of the films that, to date, has most beautifully put that digital technology to use in creating a world uses it to look backward, to anticipate a future already past, viewing it through the wide eyes of the 1930s. And, fittingly enough, it features a performance by a digital representation of the long-dead Lord Laurence Olivier. In an alternate 1939, crackerjack reporter Polly Perkins (Gwyneth Paltrow) is hot on the story of a group of scientists who have been disappearing one by one. She gets a lead from Dr. Walter Jennings (Trevor Baxter) that he is next on the list, when they're attacked by gigantic metal robots marching down Broadway. Sky Captain Joe Sullivan (Jude Law) and his army-for-hire are called in and manage to drive the things off, but not before they've captured Jennings. Polly and Joe return to Sky Captain's island hideout, where he reveals that these robots have appeared before, seizing oil, gas, and generators for some unknown purpose. 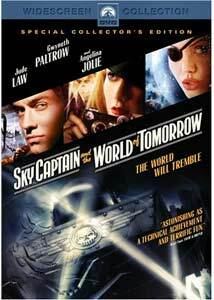 Before long, Sky Captain's base is under attack, leading to a chase around the globe in pursuit of the mad Totenkopf (Olivier) and his servant, the Mysterious Woman (Bai Ling), battling robots and facing global destruction. While such a pastiche in the style of a 1930s serial could easily slip into high camp, Sky Captain veers away from that danger, taking its story seriously and displaying a firm grasp of the best story-telling sensibilities of the period. At the same time, the visual effects (there are three times as many effects shots as in Fellowship of the Ring, which runs nearly twice as long) are astonishing and immerse the viewer in the period. Writer and first-time director Kerry Conran makes no attempt to explain Sky Captain's technology or really to provide any backstory at all, as if we have been plopped into the middle of a serial where we're expected to know who everyone is, and they make pointed references to past adventures. And since he's dealing with pulp archetypes, he's quite right: we feel as if we already know these characters and no long origin story or introduction is necessary. The pulp nature of the story is cheerfully defiant of logic or actual science, but is nevertheless enthralling in its attention to detail. The dialogue between the leads crackles with banter that wouldn't be out of place in a Preston Sturges picture. The film is practically dripping with references to pictures of days gone by (not all necessarily from the 1930s), from overt quotations of The Wizard of Oz and Lost Horizon to more subtle references to M, Only Angels Have Wings and The Third Man. The entire film is done in blue screen, with nothing really there except the actors and a handful of props. This freedom allows Conran to recreate 1939 as it may have been envisioned back in 1931, when the hopeful deco promise of the Chrysler Building was still a possibility. The visuals in the film are startling in their stylized reality, capturing a 1939 that never was, but should have been. Perhaps the most direct filmic influences are the visuals of Fritz Lang in Metropolis and Woman in the Moon, with his mad cityscapes and visions of rockets to outer space. At the same time, a noirish sensibility is everywhere, with much of the screen shrouded in black through nearly the entire running time. All of the color was stripped out and then replaced in a gentle mimicry of hand-colored photography, or taking the visuals back even further, Path�color and the glow of two-strip Technicolor. It's unnatural, but it's not only wholly appropriate for the subject matter and the time period, but it looks marvelous to boot. Bolstering the film's credibility are the participation of some big-name stars, who were forced to act in near-pantomime much of the time. Paltrow is fine as always, and she gives Polly the necessary brashness and charm to fit perfectly into the mold. Jude Law, whom I've otherwise had little use for, has an excellent chemistry with Paltrow, and he is convincing enough that by half an hour in I had completely forgotten who he was. Angelina Jolie's part is barely more than a glorified cameo, but she's still a striking fetishistic figure in military costume and eye patch. Giovanni Ribisi, as Joe's technical wizard sidekick Dex, is entertaining when he's onscreen, though Totenkopf pretty quickly captures him and puts him to work on his own nefarious schemes. Olivier is there in a distorted form, but he's hardly recognizable either in feature or voice, so it's not entirely clear why the filmmakers bothered, other than to give Law the opportunity to act with Olivier in a sense (and to make the obligatory "Is it safe?" wisecrack). But most importantly, like Raiders of the Lost Ark, this film recaptures beautifully the sense of fun in the pulpy pictures of the 1930s, with high adventure and sci-fi menaces, marrying them to modern amazing visuals. This was a ten-year labor of love for the Conrans, and it shows in every frame. It's as engaging a picture as I've seen in quite a while, and a truly unique creation that deserves to be seen by anyone with an appreciation for old films or general nostalgia, or with a desire to catch a glimpse of what the future of technology may hold for filmgoing. Image Transfer Review: The anamorphic widescreen picture looks excellent in its stylized manner; the color's not intended to be natural and the heavy use of filters give the picture a very soft, glowing appearance (similar to a George Hurrell portrait come to life) that's nicely rendered on this disc. Such visuals are very hard to compress successfully, but a very fine job was done here, with no artifacting or compression problems. The disc producers have also resisted the urge to slap excessive edge enhancement onto the picture, which would have spoiled the effect. Audio Transfer Review: Unlike the movies of the 1930s, however, Sky Captain comes complete with a state-of-the-art 5.1 DD soundtrack that's heavy on the bass and gives plenty of impact in the surrounds. Directionality is sharp, and Edward Shearmur's exciting score sounds excellent, particularly in the brass instruments. Hiss and noise are nonexistent. The attack of the robots on Broadway would make a good demo if you have a high-end subwoofer that can hit the gut-wrenching low sounds. Extras Review: Although Paramount once had a reputation for barebones discs, the studio proves with this release that they can stack on the valuable extras with the best of them. A pair of commentaries give plenty of background on the film. I found the producer's commentary to be more informative, and he's well organized and has quite a bit of interesting material, but isn't above pointing out moments he particularly enjoys. The other commentary wanders a bit and Kerry Conran doesn't talk as much as one would hope about the inspirations behind the film. He does better in the two-part documentary, Brave New World, which covers the conception and creation of the film in an entertaining and detailed manner, with behind-the-scenes footage liberally interspersed with the talking heads. Also interesting is the short featurette with brother Kevin Conran regarding the art of the film and his designs for everything from the buildings to the costumes to the ray guns. It's a delight to see his work room literally papered with sketches and drawings for the film on every surface. The original six-minute short that Kerry Conran spent four years making in his home shows just how clear his vision was; some segments survive intact (but reshot) in the feature in almost identical form. The package wraps up with a pair of deleted scenes (one of them finished) and a short gag reel that mostly features Paltrow cracking up. There's just about everything one could want here...except the trailer, the omission of which is the only thing keeping this from an A+. A handful of movies give one a revelation of the visual possibilities of cinema; watching this film was like seeing 2001 or Star Wars for the first time. Not only an astonishing visual achievement, it also manages to be incredibly fun. One of the best films of 2004, supported by a surprisingly packed special edition. I only give about 1 out of every 100 DVDs straight As, but this disc richly merits them all. Highly recommended.